There’s an old cult classic heading soon to DVD! The 40th Year Anniversary Edition of Grave of the Vampire is coming to DVD March 19, 2013. 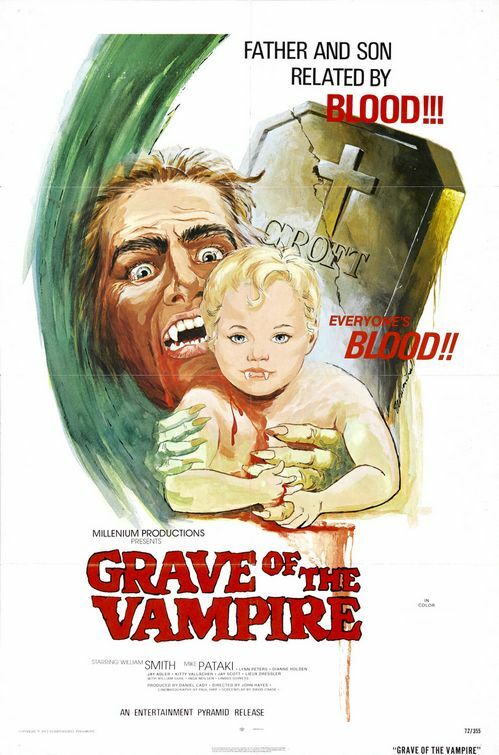 Originally released in 1972, this film shocked audiences 40 years ago when the young mother of a vampire baby began nursing it with her own blood. Grim and grisly, Grave of the Vampire quickly became a cult favorite through frequent midnight movie showings and television airings. And in just a few short months, this DVD can be yours in widescreen HD from Retro Media. Anyone here planning on picking up Grave of the Vampire? Has anyone seen this obscene movie? If so, what are your thoughts? TOTALLY CALT AND C’ MOVIE. THE VAMPIRE IS EXTREMELY GROSSLY AND THE MOVIE IS QUITE BORING. An underrated minor gem. Dark as hell too.